Yes my stitching had a much stronger pull then the reading I am meant to do for Uni. 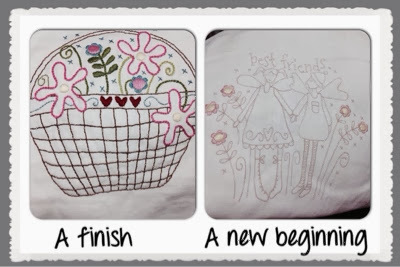 I was able to finish my basket and start on a new stitchery. Sometimes it's good to sit and do a little stitching. Your basket looks lovely. That's a wee bit naughty - you know you'll regret it eventually, but I bet it felt good at the time, right? Noone could resist stitching over text books. Well, no avid stitcher. Maybe you need to set yourself a little time each day for both so that you don't need to cram and get stressed.